Is a rhinoplasty procedure in your near future? If so, Beverly Hills Plastic Surgery group would like to go over some measures you can take to make the process go a little more smoothly, reducing pain, making recovery as comfortable as possible. Maybe you’re considering a rhinoplasty procedure to change the shape or contours of your nose, or maybe you want to improve your breathing. 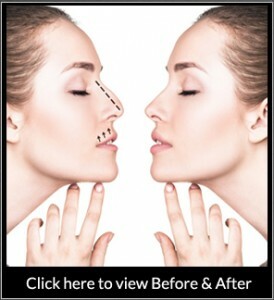 Reasons for getting what most people call a “nose job” can be either for functionality, for aesthetic enhancement purposes, or some combination of the two. Whatever it is, there will be some down time after Dr. Layke performs your nose surgery procedure. Keep reading to learn some tips and pointers for your rhinoplasty recovery. Maybe this seems like a no brainer, but sometimes people think they’re superhuman. By exerting yourself, you’re more likely to breathe heavily through the nose, which might make the process more painful. In worst case scenarios you might injure your nose and compromise your rhinoplasty procedure and recovery in some way. Beverly Hills Plastic Surgery group will prescribe medication to make your rhinoplasty recovery as comfortable and pain-free as possible. Yes, there will be an approximate 3-week downtime attached, but most patients won’t necessarily need pain killers. Many patients are surprised by how little physical pain they experience. You will experience pressure; your ears and nose will experience congestion, akin to a head cold. You can take pain medication and antihistamine as needed, but the best idea is to stick with Tylenol, in order to bypass medication side effects (which can often include constipation). At the 3-5 day mark we’ll remove internal packing and dressing. We’ll also vacuum out any debris, so this pressure will finally be alleviated. Make sure that you walk around as much as you can. Keeping your head elevated, wiggling your toes, and walking around the house periodically will increase circulation and minimize the likelihood of blood clot formation. It might be a tough transition not to sneeze through your nose. One way to get used to this is to really focus on making that classic “ah-choo” sound with your mouth. Becoming a mouth breather for the duration of your rhinoplasty recovery will help facilitate the healing process and to make sure that you enjoy the best possible results.